The 12 Deluxe rooms are located in either double (10) or single (2) bungalow style houses which are situated around the pool area, up to the beach front. Each Deluxe room is equipped with a split-type air-conditioning, flat screen TV, and a Mini Bar refrigerator. 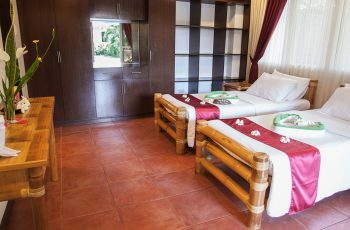 8 of the 12 rooms are furnished with 2 comfortable single beds which can also be set up as a matrimonial bed while the remaining 4 rooms are equipped with one queen-size bed. 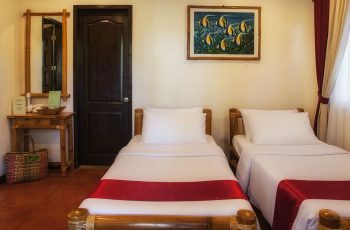 The newly renovated room also feature a walk-in dressing room as well as comfortable bathrooms that provide a nice hot shower after a beautiful day of diving. Let the terrace invite you to relax and enjoy the beautiful ambience set by the luscious garden that surrounds the rooms. We stayed 8 nights at Pura Vida and it was great! 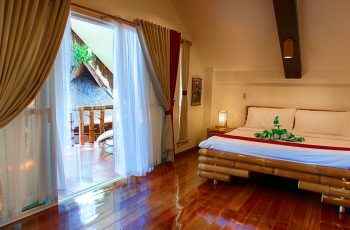 The resort is small and cosy and the rooms are nice, clean, and spacious and had everything we needed. There is also a well-equipped gym available for the guests. We stayed in a deluxe room close to the pool and we were able to get internet access in our rooms. However, internet is quite unreliable but that seems to be a fact in most places. What made Pura Vida special was the staff, they were wonderful, greeting us every day with friendly smiles and warm hospitality. We can absolutely recommend Pura Vida if you are looking for a relaxed vacation and it is perfect if you are a diver. Sea Explorers is located on the resort and their staff is professional, helpful and also very friendly. We had some great dive trips with them! This was our first visit to the Philippines and we couldn't have gotten a better "first impression"!